Are There Toys My Dogs Can Play With Together? Dogs love to play with their humans, but sometimes they want to play with each other. They’re not going to just come out and say “No Humans Allowed.” However, they may run off to their secret club house to play their own doggy games. Toys are integral to a pup’s home life. They keep dogs stimulated, help them burn off energy, and keep them from being bored, which can lead to destructive behavior. Since you have more than one dog, you would really want to do all that you can to make sure all of your canine companions are have the right toys for them. It’s great if the pups in your multi-dog home get along and want to play together. Why not encourage their bond by providing toys for them to use at once? Other than food and belly scratches, toys are probably all dogs think about. Finding toys for your pack to play with together isn’t always easy. Most of the items on the shelf at pet stores are made for one pup to play with at a time. So what toys can dogs play with together? Don’t get jealous when your pups want to test their strength with each other instead of you. Encourage them to interact by getting toys they can play with together, like tug toys! 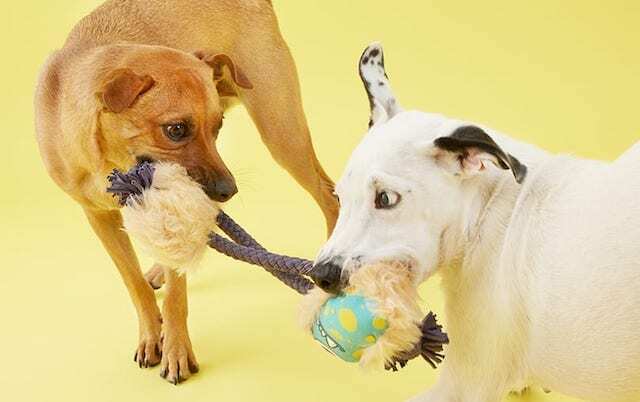 Let them have their own epic game of Tug-of-war with toys with two handles for each pup to grip in their mouths and pull. Whether it’s made of rope or rubber, make sure both gripping points are can fit comfortably in both mouths and strong enough for your pals to go full force. “Devious Devin” and “Brunhilde the Brown Squirrel” also have fun plush toys bodies that are able to move along the length of tummy safe t-shirt rope for a little added excitement! The only thing your four-legged pals love more than their toys are treats! Get their interest piqued with treat mazes that can spin and roll. 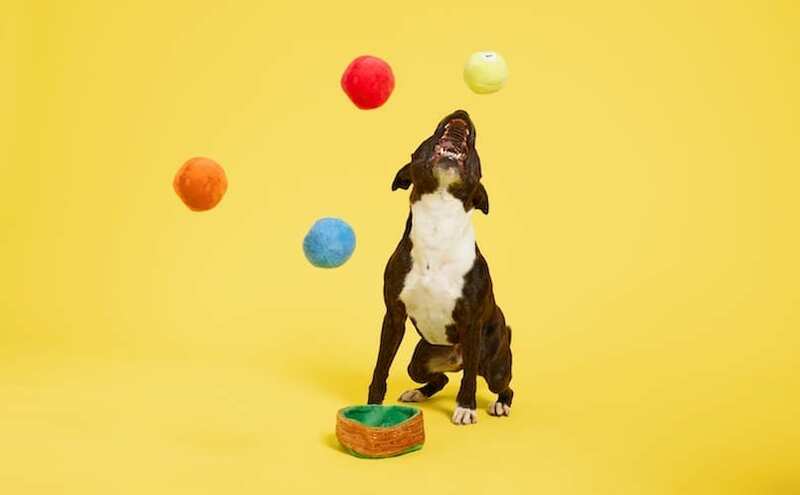 Treat dispensing toys that can hold a good amount of treats at once are great for your pups to share and to stimulate their minds. They can knock the treat dispensing toy around and be rewarded at the same time! The “Treat Maze” and the Pet IQ Treat Ball are very interactive and pup parents are even able to increase the difficulty on both toys. Your pups can spin, roll and chase these toys until they’re empty! More dogs = more toys. Multi-Part Toys are great for homes with more than one pooch. These toys give your pack tons of fun play time, can be used as problem solving puzzles, and each of your pals can squeak away all day with their own piece of the set. Multi-Part Toys tend to have about four to five pieces and some sets have extra parts can be added for those larger packs. Adorable toys, like “Willard’s Billiards” and “Andi’s Famous Plush Dumplings,” allow the pups’ parent to even tuck treats inside and watch your fur kids get to work! Keep Your Pack Stocked With BarkBox! BarkBox saves pup parents the headache of trips to the pet stores. BARK does all of the work to find the right toys and treats for your pals and sends them to your door every month! Your animal companion gives you a lot of joy, so give some joy back to your pack with the Classic BarkBox starting at $22. Each box arrives carefully curated with 2 innovative toys, 2 bags of all-natural treats, and a tasty chew to get their tails wagging. One of the best features is that you, the person who knows them the best, are able to tailor the box to fit your fur family’s needs! Feel free to reach out to the team on BarkBox.com or email at [email protected] if you have any questions. What Are Customizable Gifts For The Dog Lover In Your Life?